SUMMARY: Russia’s United Aircraft Corporation (UAC) changes its CEO/Director General as the manufacturer struggles with the SSJ-100 regional airliner, deliveries to Belgium’s VLM Airlines and Switzerland’s Comlux Aviation could not have come at a worst time for EU/US and Russian relations, Russia is very committed to having Russians flying on Russian airliners, but at what price ? the SSJ-100 deliveries began in April, 2011 and only 84 have been delivered by the end of 2014, with 13 in storage and 3 international airlines and 1 Russian airline having gone bankrupt operating them. Troubled United Aircraft Corporation (UAC), which since 2006 controls all the aircraft manufacturers and design bureaus in the country, is changing its leadership. The new CEO/General Director is Deputy Industry and Trade Minister Mr. Yury Slyussar as he replaces Mr. Mikhail Pogosyan who has held the post since February 2011. You can read more about the Russian commercial aircraft industry and the SSJ-100 and MC21 programs in my previous blogs of January 6, 2015 and January 13, 2015. Russia’s national flag carrier, Aeroflot orders 20 more Sukhoi SSJ-100 regional airliners today to add to the 30 already ordered (16 in service), just as the CEO/General Director of United Aircraft Corporation (UAC) is changed, reflecting Russia’s commitment to make the aircraft an international success, as it wants to be a major commercial aircraft player, presently in 6th place and with no aircraft the world is really interested in. The CEO/Director General of Aeroflot said what Russia’s government is looking for “we are not just supporting the Russian aircraft industry” Aeroflot is “investing in the future of the country” and our decision will “ allow Russians to fly on Russian aircraft”, the new Irkut MC-21 needs the SSJ-100 to be successful and open the global market for its entry maybe by 2020 ? Everything in Russia is political, Aeroflot orders aircraft as Government changes the top man at UAC, they are all connected, airlines, government, OEM’s, and banks. This shuffle shows that Russia is not pleased with the how UAC is performing, especially with the Sukhoi SuperJet SSJ-100, and this had to be expected as a new round of government funding has been committed to the program, which is now Russia’s show case commercial aviation program. It needs to be successful if the planned Irkut MC-21 narrow body airliner will be successful in the coming decade, Russia is trying to line up India and Indonesia to help it make it happen, but right now Russia is politically isolated and may have to do it alone, and history has shown it can’t, too many products no one wanted and low production runs of less than 20 aircraft per year have been hallmark of the Russia commercial aircraft industry. In the move, Mr. Mikhail Pogosyan will remain the manufacturer’s main chief designer, he in my opinion has done a wonderful job in the 4 years he has held the post, just had so little to work with in terms of viable, sustainable aircraft programs. I think having an aircraft designer run a RUB 285 billion ($US 4.3 billion to $US 5.2 billion – depending on where the Ruble is on any given day) is not the best idea. You need commercial people at the top, sales and marketing are Russia’s weak point on top of designing aircraft that few want. The new CEO/General Director has experience as previous head of the Aircraft Industry Department within the Ministry of Industry and Trade 2010-2012 then became Deputy Minister responsible for the aircraft industry. Knowing how crony capitalism works in Russia, this management change is no coincidence given that the commercial aircraft industry is now being given top priority by the Government and more importantly lots of money. As that news came in, it was announced that Russia’s national carrier, Aeroflot ordered another 20 SSJ-100’s on top of the 30 it already ordered with 16 now in service. The statement by Aeroflot’s CEO Vitaly Savelien, says novels about how Russia is now eyeing the SSJ-100 program, “we are not just supporting the Russian aircraft industry” Aeroflot is “investing in the future of the country” and our decision will “ allow Russians to fly on Russian aircraft”. 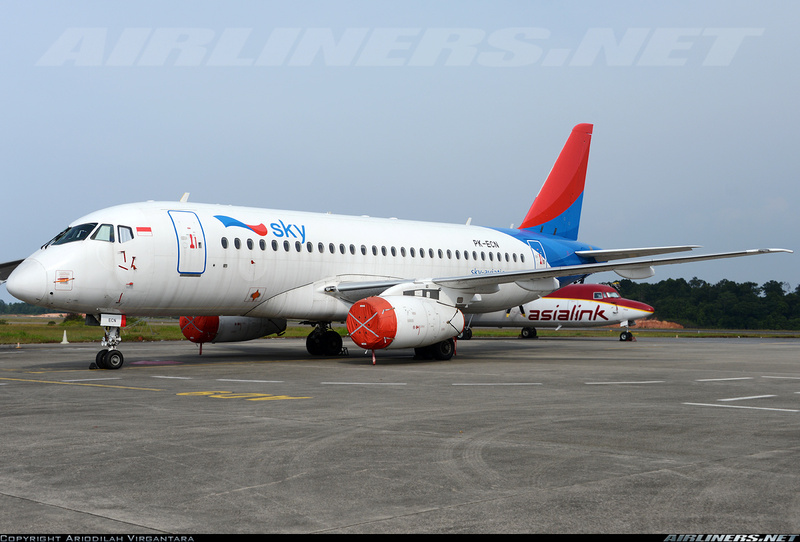 A SSJ-100 of bankrupt Indonesian Sky Aviation, in storage in Indonesia still ! with 3 foreign airlines bankrupt with the SSJ in less than 3 years, the question has to be how desperate are the sales ? how was product support ? aircraft dispatch reliability ? it says novels anyway when you have 13 out of 84 delivered aircraft in storage (15% of delivered fleet) and 4 airline bankruptcies. The lease terms are very low, but will the Russian banks be able to continue with such low leases when their borrowing is curtailed by sanctions ? and then you finance high risk operators with little cash and you get 4 bankruptcies in 2 years and a mess to deal with. As for the success of the aircraft, the story is not good, deliveries of the SSJ-100 began in April, 2011 to Armenia’s Armavia ! which had 2 on order, accepted 1 and had no money for the 2nd one, eventually went bankrupt, bad choice of launch customer for sure. Then Lao Central (Laos) and Sky Aviation (Indonesia) went bust, and several SSJ-100’s were sitting in Laos and Indonesia and may still be there today and Russia’s Muskovia went best, that is a lot of bankrupt airlines in only 44 months of the program. On top of that 13 are presently in storage (inc. the Lao Central and Sky Aviation aircraft), but also several early Aeroflot units which Aeroflot was not happy with. Only 84 have been built, so production is not very high. 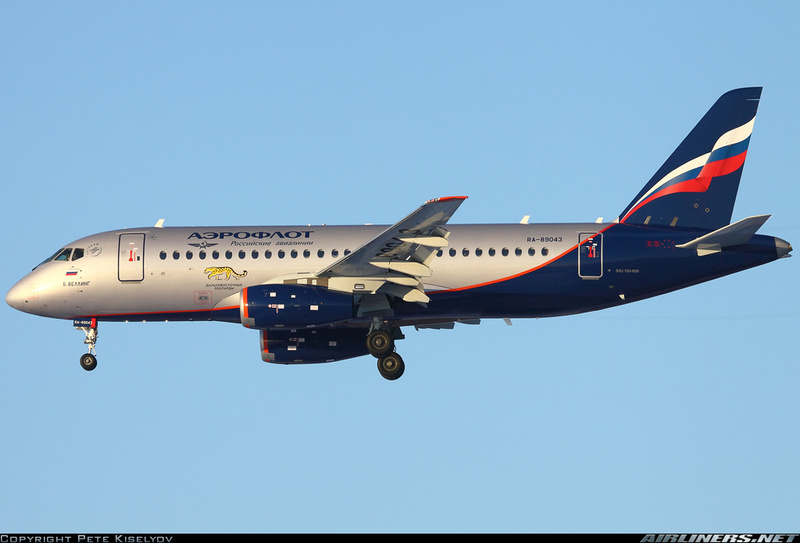 The last aircraft delivered in 2014 was s/n 95084 to Aeroflot which again has 16 now in operation. The aircraft has a shaky history already, the only good news at this point is that Mexico’s Interjet seems happy with their 20 aircraft delivered, so there is hope. Current large customers of the SSJ are Russian Government, Aeroflot (16), Interjet (20), Gazprom (oil company, 9), UTAir (6). With only 84 units have been delivered between 2011 and 2014, or an average of 21 per year, the next 4 years the government and banks are calling for a minimum of 221 deliveries a 163% increase. The supply side can be solved with lots of money, the demand side is a different animal all together, as Russia’s is not known for good sales and marketing, quality products, reliable products, yes many local airlines will buy as will local oligarch billionaires as those that are on the sanctions list cannot use their western business jets, and Putin will surely want to see his oligarchs with Russian business jets. The backlog of 80-85 units will require a lot of Russian airlines ordering the aircraft, but as my previous blog of January 13, 2015 pointed out Transaero Airlines, Russia’s #2 airline just got state aid and it has 6 SSJ-100’s on order, while UTAir is also seeking state aid and will reduce its 93 aircraft fleet by 40% in 2015 in a major restructuring and while it has 74 aircraft on order it has an order for 24 SSJ-100’s ! so the situation there has to be of great concern for UAC, but it is very likely that more airlines will be seeking state aid in Russia with he collapse of the Ruble (RUB) which is dramatically having an affect on passenger demand, especially on international flights. So the domestic market will not be easy, and with sanctions and a Cold War back on, the international side does not look good for UAC at all. The worry has to be international customers, in the past 20 years those have been limited to countries like Turkmenistan, Cuba, North Korea, Kazakstan, Laos, Armenia, etc. not really countries with a big demand for commercial airliners. Russia has few big allies it can count on for business, India and China at best, but China has its own ARJ-21 and C919 program to fill the same void in the market that the SSJ and MC-21 are to fill in Russia. With the current political climate being bad, I don’t see too many western airlines buying Russian airlines, surely not the 150 that UAC expects in South America or the 100 or so VIP models, few western businessmen will want to fly around in a Russian aircraft, especially in North America, just being honest and realistic. It was the terms and conditions on the SSJ that got Interjet to buy the aircraft in Mexico, you can do that a few times, but they offered the same with Lao Central, Sky Aviatio in Indonesia and Armavia in Armenia, 3 airlines that could not get financing from western OEM’s and for good reason, they all vanished within 24 months of operating the aircraft, and UAC had to repossess the aircraft and one of the reasons it has 13 in ‘storage’ (few units parked in Indonesia and Laos still). As for the 115 seat stretch version, well that will require more money and in a tough market segment, the 100-149 seat market is not what it used to be to the horror of Bombardier and its CSeries. and you will be up against Embraer, Bombardier and Mitsubishi all of which have better products, reputation, experience and brands, I am not convinced that the minimum delivery conditions will be meet, hard to see 45 deliveries in 2015 and then 60 by 2017 without big order customers, and then ? 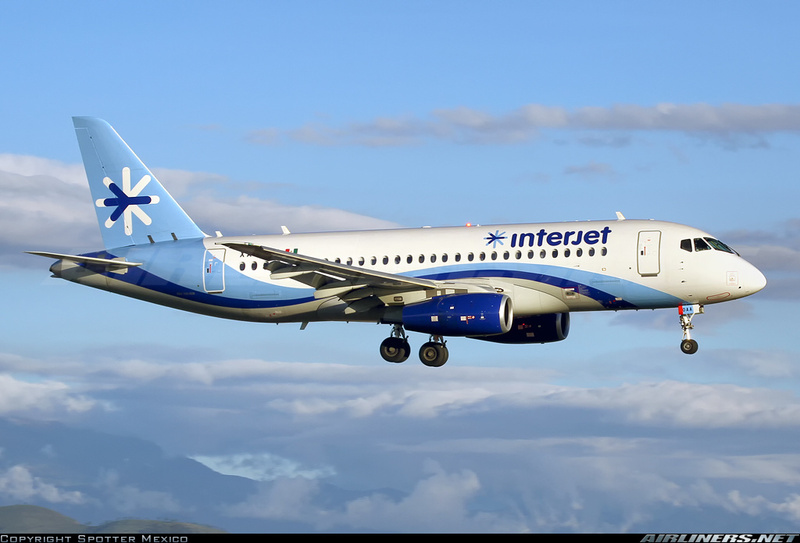 Mexico’s Interjet has 20 SSJ-100’s in service and is happy with them, so far the only international customer as SSJ airlines in Laos, Indonesia and Armenia have gone bust. A stretched model is going to appear by 2019, it was part of the conditions for the new round of financing for the program by Russian government owned banks (all now under US/EU sanctions). The Comlux Aviation SSJ’s are suppose to be s/n 95097 and 95115 meaning delivery should be this Spring for VIP conversion in Indianapolis (USA). The 3 VIP SSJ aircraft recently ordered by the King of Thailand are s/n 95101 and 95102, which I assume will be VIP completed by Comlux Aviation, and at this time no VLM Airlines delivery is booked, as it is only a LOI still. Yes, Russia is out to have its own aircraft, ideally free of Western suppliers, but that is not possible in today’s globalized aerospace market, the $US 36 million 87 passenger SSJ-100 with the French SaM146 engine is over 60% by value ‘western” anyway. Off course Aeroflot already has ordered 50 of the Irkut MC-21 narrow body airliner which is planning a 2018 delivery to the 1st customer, but as I have said previously it will be at best 2020 and maybe never. The BIG issue for UAC on the commercial side is marketing and selling the SSJ-100, lots of investment and so far only Interjet of Mexico is the only “western’ customer (which actually flies the SSJ-100 to a few destination in Texas, USA), the rest of the SSJ’s are in Russia, with failed airlines in Armenia and Indonesia having returned their SSJ-100’s. The aircraft is expected to sell well in the VIP market at about 8-10 aircraft, and they think 150 in South America, but the new Embraer E2 will shut the door on its ambitions there and globally, if it cannot sell well now, it won’t sell well in 3 years when the E2’s are certified and selling. As far as the VIP market, the Embraer Lineage 1000E a conversion of the Embraer 190 is a better choice than the SSJ VIP model, it has a bigger cabin, range of 8,300 km and priced at $US 49 million (negotiable as demand is not high for commercial aircraft VIP conversions, be it BBJ and ACJ). The 1st European customer is looking like VLM Airlines of Belgium which was recently bought out by management in a MBO (management buy-out) which may have been Russian financed, VLM Airlines is to get 2 x SSJ-100’s this Spring with options for 10 more, it is a big deal for UAC and a badly needed order, yet the LOI has not as of today been converted into a firm order, with Comlux America also set to take its 2 ordered SSJ-100’s soon for VIP conversion. I believe this is NOT the time for EU and US companies to be buying Russian aircraft, the Cold War is back on, 4 rounds of economic sanction against Russia are hurting everyone in the EU, as the west had to act in regard to Russia’s annexation of Crimea, support for Eastern Ukrainian separatist and the downing of MH17. Ideally the next round will include sanctions on Russian aircraft, if not then the citizens of Europe can express their dissatisfaction with Russia by not flying on Russian airliners, boycott VLM Airlines and any other operator of Russian aircraft. This is not the time to be supporting the Russian commercial aviation market as it looks to take on Embraer, Bombardier, Boeing and Airbus. I am sure more aviation news will come out of Russia and I will be here to comment on the issues. « ABSTRACT: MAYDAY ! Russian Ruble (RUB) half its value of a year ago and oil prices at a 6 year low of $US 48/barrel while Russia needs the Brent oil price at $US 105/barrel to balance its budget and EU/US sanctions in place with more to come, the Russian airline industry is feeling the pain, Transaero Airlines asks for and gets State Aid while UTAir is also in line for a bail out, will national flag carrier Aeroflot and others be next ? how will the commercial aircraft industry move forward with the Sukhoi SSJ-100 and Irkut MC-21 under these harsh economic times in Russia ?